Does it Sink or Float? My husband and I were reminiscing recently about eating at the dining hall at the college where we met. We talked about our favorite meals, the nights we ate waffles with ice cream for dinner, and I remembered pouring sprinkles into my glass of Seltzer Water when I was bored or trying to avoid studying for an exam. I loved watching the sprinkles dance in the water. Suddenly, I came up with the next science experiment with water for my son! My husband joked that at least I got something out of my college education – ha! Anyway, I set the stage by taking out three clear containers that we purchased at IKEA. These are usually used for cereal storage in our home, but happened to still be empty. We then used our Soda Stream to make seltzer, though I would have purchased inexpensive seltzer or clear soda (like Sprite) if I didn't have one of these. We filled each container ½ of the way up. I knew I wanted to experiment with sprinkles (or jimmies, depending of what part of the country you live in), but wasn't sure what two other items to try. We looked around the kitchen and checked our pantry, and ultimately, decided on coins and popcorn kernels. I explained to my son that we were going to see what happened when we dropped each of these items into the seltzer or bubble water  as he likes to call it. 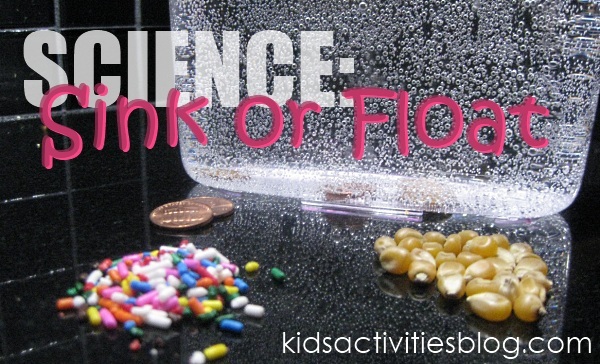 Would the items sink to the bottom, float on the top, or dance up and down on the bubbles? He made a prediction that the money would sink (he has dropped coins in fountains and bathtubs before), but he just said, I don't know, Mama. Let's just find out,  when I asked about the sprinkles and kernels. And so, we began our experiment. We started with the rainbow sprinkles which promptly got eaten before we could drop any into the seltzer. Having done this many times in college, I was sure that the sprinkles would dance. 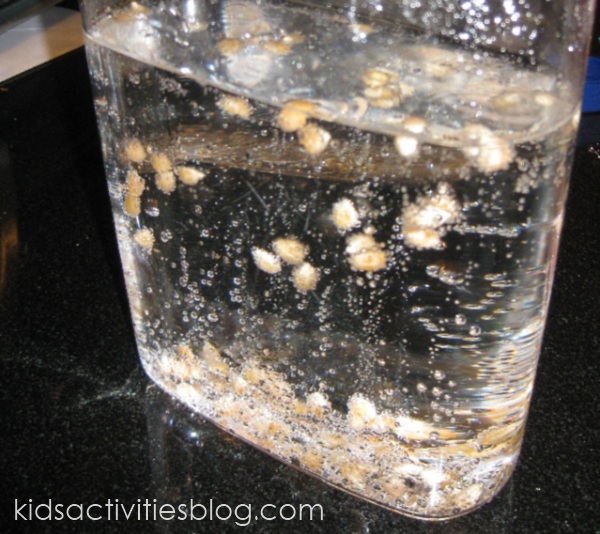 He poured them in and they bounced for only a few seconds and immediately began to float on the surface. I was surprised and, frankly, a bit disappointed. I really thought that this would be the most interesting container to watch. Oh well, that's science for ya! 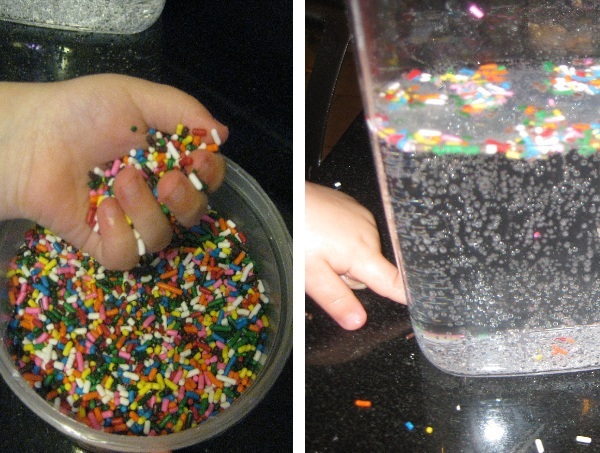 When the container was disturbed (tapped, shaken, or had a toddler arm in it), the sprinkles would start to sink and then float back to the top. They also started to make the seltzer cloudy after a while (but they were apparently still tasty). We moved on to the coins next. My son put them into the container and they immediately sank to the bottom, as predicted. Although the coins remained there, it was actually quite interesting to watch how they collected bubbles on their surface. My son's favorite part about the coins was the noise they made when dropped into the water! We used the popcorn kernels last. I didn't know what to expect. My son dumped the kernels in and, much to our delight, they started dancing. Some of the kernels stayed on the bottom and some stayed on top, but many of them bounced up and down (which was what I thought the sprinkles would do). It was quite fascinating (and kind of pretty) to watch. We had fun examining each container and I was pleased that I (accidentally) had one item to represent each of the three actions. Of course, before we cleaned up, we had to see what would happen if we mixed the sprinkles, coins, and popcorn together. Although these were the materials we chose to use, I would love to find out what you try at home when you experiment with water! Amy is stay at home mom to a 4 year old son and a 18 month old baby girl. Before becoming a mom, Amy was an elementary school teacher and has a Master's in Literacy Education and a Reading Specialist certificate. She is also the director and teacher of a local Kindermusik program. She loves theater, music, and dance, and of course, playing with her children. Amy writes Stuck Under a Baby, tweets as @stuckunderababy and can be found on Facebook. Previous Post: « Haircut, Wash, Blow Dry, Style and Hair Color for Only $29 + Other Hair Deal! 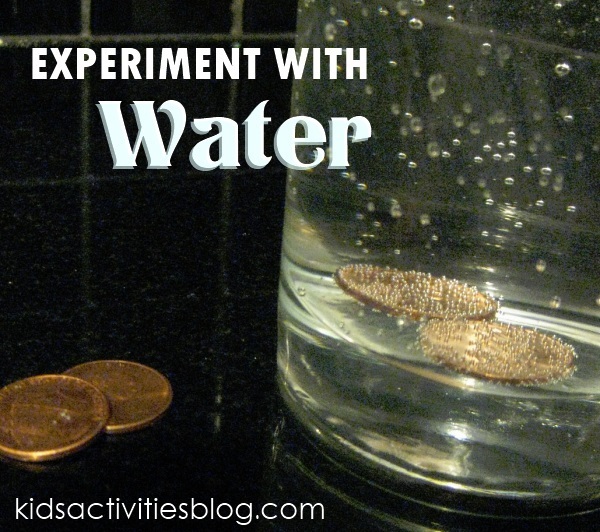 GREAT way to give kids a visual of the carbon dioxide gas inside the liquid! I love this science idea. I cannot wait to try it with my preschooler!